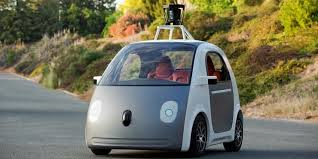 HomeWhat are the short- and long-term implications of self-driving automobiles? McKinsey’s take: In a world where people don’t take charge of the wheel themselves … we’ll all be better off. From Google’s fleet of driverless cars to the Mercedes-Benz Robo-Car concept, self-driving automobiles are stepping off the pages of science fiction and into real life. But how many of us have really stopped to think about how the adoption of self-driving vehicles will change everyday life as we know it? The number of car crashes will plummet. “Drivers” will become “riders,” with more time for working, leisure and interaction with others. “Dead time” in commuting will decrease, and productivity will increase as a result. The ubiquity of the multi-car household will change. And it’s not just McKinsey that is looking at self-driving cars with such optimism. But self-driving cars won’t overtake conventional automobiles in one fell swoop. The McKinsey report outlines a timeline for adoption of self-driving features — and it’s pretty drawn-out. Within the next three to five years, McKinsey anticipates that cars will self-handle highway cruising and traffic jams. The more difficult challenges of driving in urban areas and dealing with variables like pedestrians, cyclists and so forth will be tackled over the coming 25 years. Thus, the impact of “autonomous” technology will be limited until about 2020. McKinsey figures that the technology will experience growing pains in the years 2020-2035 as driverless cars go more mainstream. The McKinsey report takes us beyond the year 2040, too, which is the point when McKinsey predicts that autonomous cars will become the primary means of transport in the United States. 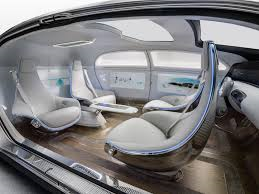 Mercedes-Benz “car of the future”: Seats facing every which-way. Car designs will change dramatically – no more need for mirrors and pedals … and car seats will face any direction. Space savings on streets, roadways and parking lots from more efficient vehicle use. Fewer cars will be needed compared to today, with one autonomous car doing the job of two conventional vehicles in the typical household. The vehicles will be more expensive but fewer of them will be needed, for net savings for consumers. As for the economic impact, the figures are difficult to quantify as some sectors of the economy will be up and others down. But with a projected 90% drop in car crashes, the savings in auto repair and healthcare bills alone are project to be around $180 billion. If we accept the McKinsey report’s bottom-line findings, it seems the “brave new world” of self-driving cars can’t come soon enough. But what are your thoughts? Are there negative implications or “unintended consequences” that will be part of the revolution? Please share your perspectives here.